This page is for those who want the instructions to fold a fuller-bloom new Kawasaki's rose flower. This design is a modified version of "new Kawasaki's rose" with fuller-blooming effect. If you have not learned folding the new Kawasaki's rose yet, I recommend you to learn folding the original new Kawasaki's rose first. 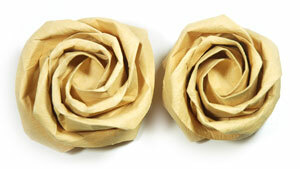 You may use any kind of paper to fold the Kawasaki rose flower. 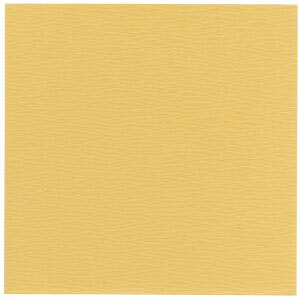 It is recommended to use a paper with the same color and texture for both front and back sides. The reason is that a part of back side will be shown in the final model. Make sure the paper that you use is a square (all sides are equal and all the angles equal 90 degrees). The paper I am using here is 20cm x 20cm square one. Beginning part of the folding sequence (up to the steps #35) is exactly the same as the new Kawasaki's rose and you can skip this. what the front side of the paper we will be using in these instructions looks like. what the back side of the paper we will be using in these instructions looks like. The back side is the same as the front side.